Welcome to Hidden Treasure Gold Mine. We have been family owned and operated since 1963. Our little shop may not look like much from the outside, but it is the real gem of the family. 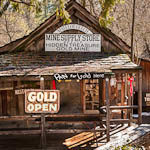 The Hidden Treasure shop was built in the mid 1800’s and was originally a bee keeper’s cabin located on Shaw’s Flat Road. The cabin was transported over 3 miles and relocated to Columbia State Historic Park in the 1900’s. Through the years it has grown to be one of the most popular shops in town. To the present day it remains the only structure in the park privately owned and has been in the family for over 40 years. Come visit the shop where many treasures can be had at unbeatable prices and the friendliest customer service you will find. Thank you to all our faithful customers and schools who continue to patronize us, it’s because of you we continue to survive.